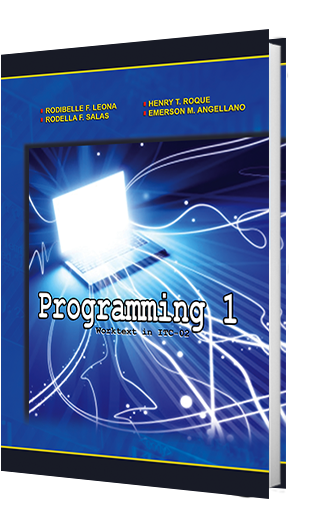 Programming 1, WorkText in ITC-02 was created to enable Information Technology students understand the basics of programming using the C++ Language. It is designed in such a way that the context of the language can be easily comprehended by the students with less of the jargons of a computer language. The authors discussed the programming concepts thatwill introduce the students to the world of programming. They tackled the components of the computer system, the steps used in programming, the elements and the programming paradigms. The second chapter deals mainly in the history of Programming Languages where the Control Structures and Flowcharts are also discussed. This WorkText also included the discussion about Code:Blocks, its parts and functions. The WorkText also has a comprehensive discussion about the identifiers and data types, the operations that can be used in programming (mathematical, relational and logical) and assignment statements. The simple Input/Output commands are also given ample discussions. The last part is consist of the decision making structure wherein data is subjected to comparison and the course of action of the program will be based on the value of the comparison. Seatworks and Laboratory Exercises are also included in this WorkText so that students will be able to apply what they have learned through the discussions. Categories: IT, Our Product. Tags: College Books, Emerson M. Angellano, Henry T. Roque, Information Technology, IT, Programming, Programming 1 Worktext in ITC-02, Rodella F. Salas, Rodibelle F. Leona. The concept approach of the book is suitable for undergraduate non-Biology major students. The book is designed to be useful workbook for students enrolled in Biology subject. It is divided into eight units which cover major topics such as cell biology, genetics, evolution, ecology, biological diversity and plant and animal biology. 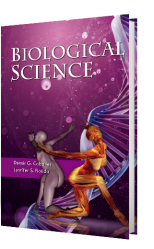 Each part has balanced coverage of all topics sufficient for a semester-long course in Biology. The authors considered these topics as important pans of biology which will provide the core knowledge in science. The opening unit of the book gives an overview of how the field of Biology is studied and explored using scientific method. Unit II deals with biological molecules that account for the structure, function and even the origin of cells. The next unit provides discussion on energy and metabolism which is the central phenomena in the study of biological organisms. It is followed by the study of heredity and the evolutionary process in the heritable characteristics (Unit IV). Basic ecology concepts are introduced in Unit V while biodiversity is main focus of discussion of Unit VI. The last unit deals with plant and animal biology. Each chapter included in every unit is provided with self-assessment part which includes quick recall questions and questions that elicit critical thinking. Moreover, helpful materials that would reinforce learning are appended towards the end in an effort to provide additional information among the users of this book. Furthermore, laboratory exercises are incorporated for each chapter in order to supplement the concepts learned in the lecture and to make them responsible in their own learning through manipulation and discovery. The authors of this book have been friends and colleagues for several years and, while they have often discussed writing a book together, the timing never seemed quite right. Finally, they put their heads together to come up with a “generic” book suitable for non-science students with different major and coming from various institutions. The authors' collection of lecture notes from several years of teaching Biology is the basis of the content of this book. Any comments or suggestions for the improvement of this book will be appreciated. HISTORY IS COMMONLY DEFINED as a story about the past that is significant and true. Admittedly Jose Rizal is an item of the 'past'. Arguably nonetheless, the known information about his life, works, and writings—which can be proved `true' based on preserved 'relics' and artifacts—are significant even to present generation. History subjects like Rizal can be meaningful and practicable though it largely depends on the teacher presenting the subject and the instructional materials used. Pertinently one of the humble aims of this book is to introduce the course in such a way that the teacher and students alike would find it interesting and meaningful. In light of recent findings, this book, for instance, discusses what happened to Josephine Bracken, Paciano, Dona Teodora, Rizal's other siblings, and other relevant Filipino heroes after Rizal's martyrdom. Many sections deal with historical controversies like whether or not Rizal indeed graduated as 'valedictorian' in Ateneo (as some references claim) and whether or not he did write the poem `Sa Aking Mga Kabata'. It contains interesting 'interactive online activities' and suggests supplemental online readings. Connectedly, the hook is compatible with online education program. Whenever appropriate and needed, significant remarks and relevant supplemental information are embedded in the lectures. Some lectures also state the relevance, value, and applicability of the topics to our lives. To be appealing to young generations, some lectures somewhat deviate from the traditional too formal (like straight news) style. Instead, they are written the way blogs and online articles are. 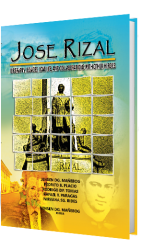 As many schools are now including other Filipino heroes in the syllabus for the Rizal subject, this book pertinently features many of them (e.g. Del Pilar, Bonifacio, and Aguinaldo as it identifies Rizal's relations and collaborations with them. Our country had been set apart to have a hero in the person of Dr. Jose Rizal, At the tender age of eight, he was already aware of the importance of nationalism and began honing his artistic talents for the country, as can be seen in his first poem “Sa Aking mga Kabata”. 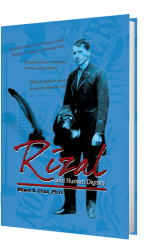 Although extraordinarily gifted, Rizal chose not to enrich himself with his God-given talents but instead try to uplift our country by reaching out to Filipinos through his writings. Each one of Rizal's work of art is a masterpiece, filled with human values, ideas, lessons, and principles that were deeply embedded within him. His works are timeless, the messages they convey still touch the lives of modern Filipinos just as they have touched the Filipinos during the Spanish era, filling their hearts with love for the country. Included within these pages are some of Rizal's best poems and essays, every one of them filled with meaningful messages with which will enlighten and encourage the Filipinos who will read them to love and serve the country. With this purpose in mind, each literary piece featured here is accompanied by information as to when, where, and why it was written by Dr. Jose Rizal. Written commentaries by distinguished personalities are also presented for each literary piece. Furthermore, much effort had been exerted and diligence in presenting the various ideas and values that Rizal had been implanted within his poems and essays. Let this short journey into the mind of Rizal through his poems and essays bear fruit in the lives of the readers, enriching them not only with fortitude but excellence and uprightness as a person. With every glimpse of Rizal's person mirrored in his words, let us not forget that there was once a man whose dreams were dedicated to the Philippines. His every labor was for the betterment of the Filipinos; his death was for the glory of the country. Let us stand witness to the greatness of the man called Dr. Jose P. Rizal.